Free State Chocolate Pear Pudding. Happy Mother’s Day. Any fun plan for today? We are staying in and not going too far as we are still adapting to my Daughters new gluten-free diet. Free State Chocolate Pear Pudding anyone? Yummy. 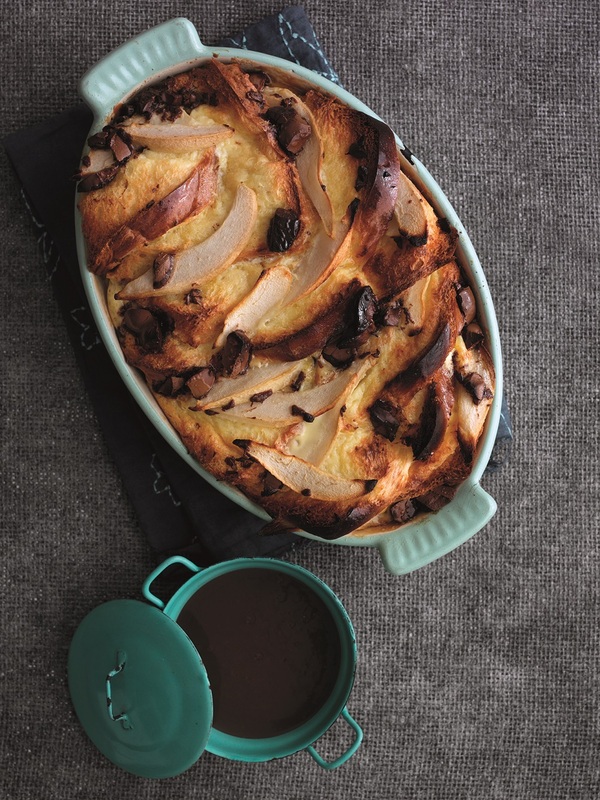 This fabulous bread and butter pudding is made with brioche or Italian Panettone with dark chocolate chips and South African pears for a delicious twist. 1 Use a small knob of the butter to grease a 1.5 litre baking dish. Spread the remaining butter over the slices of brioche or Panettone. Cut into smaller pieces, then arrange in the dish with the pears. Sprinkle the chocolate chunks over the top. 2 Beat together the eggs, milk, single cream, caster sugar and vanilla extract. Leave for a few minutes so that the sugar dissolves, then slowly pour into the dish. 3 Cover the dish with cling film and leave to stand for at least 30 minutes. If you want to cook the pudding later, refrigerate until required. 4 Preheat the oven to 180°C/Fan 160°C/Gas Mark 4. Bake the pudding for 30-35 minutes until puffed up and golden brown. Cool for a few minutes while making the sauce. 5 Put all the ingredients for the chocolate sauce into a non-stick saucepan. Heat, stirring constantly with a small whisk until smooth and thickened. Serve with the pudding. Cook’s tip: Serve with single cream or crème fraiche instead of chocolate sauce. This campaign is run by HORTGRO, the industry association representing South African fruit growers. Recipe and images courtesy of South African Fruit. What do you think of this Free State Chocolate Pear Pudding recipe? How To Make Elgin Valley Peach Blatjang. South African Pink Lady, Stilton And Caramelised Pecan Salad. How To Make A South African Energy Bowl. How To Make Pink and Delicious South African Baked Apples. "Baked Mascarpone And Lemon Drizzle Cheesecake"
We have a pear tree in our yard and I never know what to do with all of them. Thanks for sharing your recipe on Merry Monday. Pinned. What a beautiful dessert. I love pears and chocolate together. Thanks for sharing at the What's for Dinner party.